Putting together a new website for the first time can be tricky stuff, least of all finding the right web host that works for you and setting up an account. So to help make the process quick and easy, we’ve put together a foolproof four-part video series on how to get a web hosting account and have your WordPress website up and running in no time. Part 1 introduces the series and Part 2 goes through the different types of web hosting options available, including shared, VPS, Dedicated, Cloud and Managed WordPress hosting. Part 2 also explains what web hosting involves and provides a step-by-step walkthrough on how to register for a web hosting account. Part 3 details how to install WordPress using the 1-Click install available with many web hosts. This four-part series provides all the information you need to set yourself up with a web host and get your WordPress website up and running. Part 4 explains how to access your website and WordPress admin panel after you’ve set everything up. In addition to the series, we’ve also put together Famous 5 Minute WordPress Install Tutorial, which details how to install WordPress from scratch when you don’t want to use a 1-Click install. This tutorial is super convenient for anyone planning to install WordPress for the first time or is just having trouble setting it up. So Who Should Watch This Series? Everyone learns differently and the great thing about this series is that it doesn’t just explain how to use web hosting, it shows you in a clear and concise way what you need to do to get WordPress working with any web host. 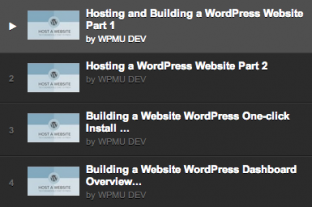 The WPMU Dev YouTube channel features more than 150 videos, providing a fantastic tutorial resource for learning how to better use WordPress and WPMU DEV. Whether you want to find out more about using the WordPress admin panel or getting the most out of a WPMU DEV plugin like MarketPress or Appointments+, our YouTube channel will help you find out what you need to know. Have you checked out our videos? Tell us what you think about them in the comments below.